The following letter appeared in the latest edition of University’s Greater Magazine. It is my attempt to communicate my new ministry role. Unless you have heard me mention it in a sermon, you might not know what I did before I became a pastor. I decided in high school that I really wanted to be on the radio. I went to the State College of New York College at Fredonia and majored in Communications with my emphasis on radio. I worked at my college radio station beginning in my freshman year and worked my way up to General Manager. I got my first commercial job at a small AM radio station in Fredonia. After graduation, I worked at radio stations in Mt. Pocono, PA; Allentown, PA; and Austin, TX. I worked for Clear Channel Radio in Austin when I heard my call to ministry and began seminary. I saw the radio business and the world of communications change drastically during those years. When I started, I played vinyl records, and I took requests on the phone; when I left the business, all the music was played from a computer, and requests came via email. When I went to seminary, I thought I was leaving most of that behind me. I knew I would still be communicating, just sharing a different message. I thought that the means of communication would be mostly the words spoken from the pulpit. However, communicating hasn’t just changed in the commercial world. Advances in technology have changed every aspect of how we communicate. That means I can’t leave my training and experience behind. Most churches have fallen way behind, and some are trying to catch up. That is really too bad for two reasons. First, we possess the greatest message ever revealed. Second, we wouldn’t be here if it wasn’t for the fact that the earliest Christians were amazing communicators who used every resource they had to spread the message of Jesus Christ. The first Christians used one of the greatest communication technology breakthroughs ever to help share the news about Jesus: roads. The Romans created their roads to keep the empire together, but Christians took advantage of them to share the Gospel message in a way that was never before imagined. What if the church followed in that tradition and used every resource available to tell people about Jesus? That question defines my new role here at University. You will see me in the pulpit much less, but I hope to have an even greater impact on helping people know about Jesus and grow in their relationship with Jesus. I will be helping us, as a church, take advantage of the revolutionary breakthroughs in communication technology to communicate with each other and to share our faith with our community. University is unlike any other congregation. We exist for a reason: we care about people and want them to meet Jesus and have a lifelong relationship with him. We have an important message to share with each other and the world. I want to see us use every tool at our disposal to share that message. • better methods for communicating with each other so that members can know what is happening even as we grow larger. This magazine is one of the ways we use technology to communicate. The printing press has been around for a while, but it is still a powerful tool. 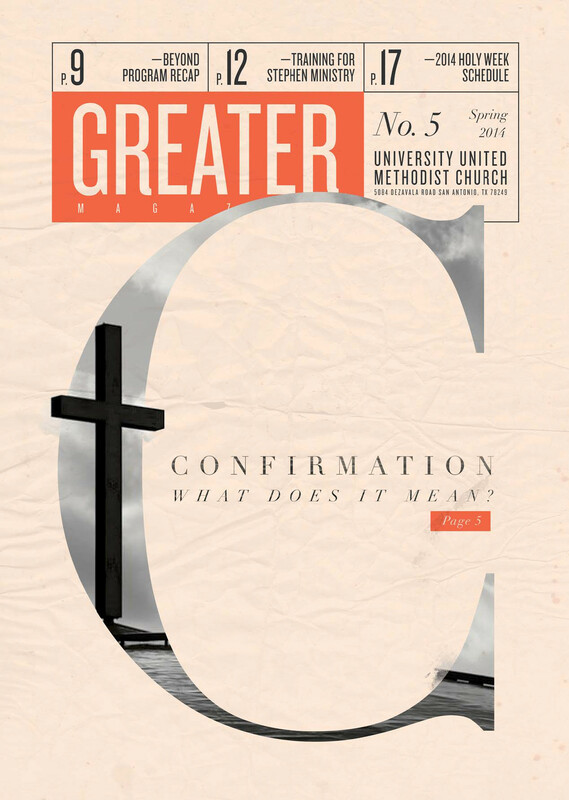 I hope in the pages of this issue of the Greater Magazine you will be connected to the great things God continues to do through University United Methodist Church. Inside, we take a closer look at the importance of confirmation in the lives of our young people. We also meet the latest class of Stephen Ministers and learn about their vital ministry.